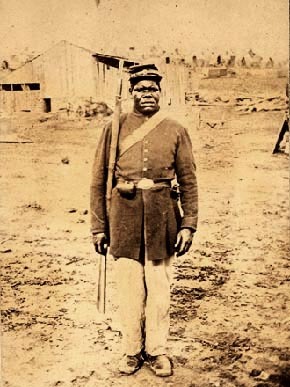 Private Hubbard Pryor after enlistment with the Forty-fourth U.S. Colored Infanty in October 1864. The Forty-fourth USCI was one of over a score of USCT regiments organized in Tennessee, and took part in the fighting at the Battle of Nashville in December 1864. Several Alabama USCT regiments were organized and trained in Tennessee.